This week’s featured property is a post-war home on 810m2 suitable to sub-divide and develop 2 modern residential dwellings. It’s 12 km from the city in a quite suburb comprised of post-war homes and slowly emerging medium to large contemporary family dwellings. It was recently purchased for $580,000 with a potential capital gain of approximately $132,700 within 12 months. This is a great example of a smart buy and how you can develop for profit or hold long term and develop in the future. These double blocks are my favourite investment option! The immediate location for unrenovated post-war homes on land with 810m2 has seen 29% growth in the last 3 years. Equivalent homes 3 years ago were selling for approximately $450,000. The home is already surveyed into 2 allotments saving the expense and town planning involved to split the block into 2 parcels. That equates to a potential saving of approximately $20,000-40,000. These sales have been included to illustrate the value of buying a double block post war home if your budget can stretch further. 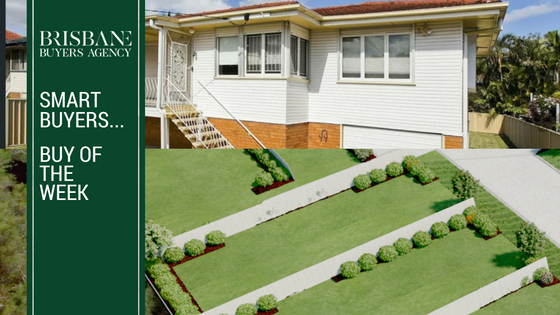 We put this property through our proprietary property analytics tool, our Smart Buyers Index and believe it was a great opportunity for property investors or developers. Our Smart Buyers Index gives our clients the inside running on smart buys in Brisbane. We’ve developed it from our more than 20 years in the property industry working as a registered valuer, quantity surveyor and in sales. When you work with us that means you can tap straight into our experience and save yourself loads of time, money and frustration.